Fifth grader Caleb Grigg (left) won the 5th and 6th grade Spelling Bee held November 8th. 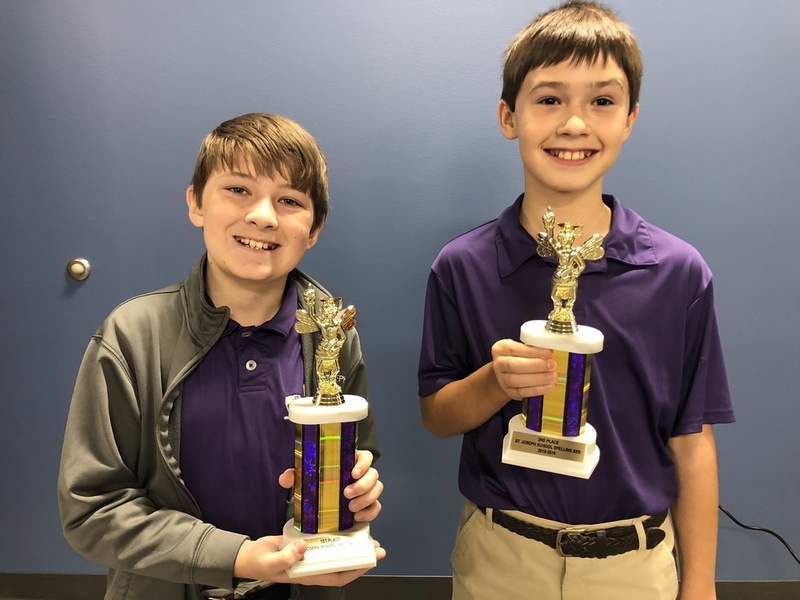 He and fellow 5th grader Brody Mallett battled it out for an amazing 42 rounds with Caleb winning 1st Place by correctly spelling "ricotta." Brody took home the 2nd Place trophy. Both boys will now be eligible to participate in the Faulkner County Spelling at Conway High School on January 12. Fifth grader Trevor Jackson, who finished 3rd, will be an alternate should either Caleb or Brody not be able to attend. The trophies were made possible by a grant from the Herman and Bonnie Moix and St. Joseph Class of 1967 Endowed Spelling Bee Fund.